The Georgia Chapter was selected by the American Academy of Pediatrics to participate in their Chapter Quality Network (CQN) asthma learning collaborative for 2015.Starting January 2015 through October 2015, twenty-one pediatric practices from the Georgia Chapter will participate in a learning collaborative designed to help practices improve the care and outcomes of children with asthma by implementing the NAEPP/ NHLBI optimal asthma care guidelines. Optimal asthma care consists of the following NAEPP/ NHLBI guideline-based practices: 1) Assessment of asthma control, 2) Stepwise approach used to identify treatment options or adjust therapy, 3) Written up-to-date asthma action plan, and 4) Persistent asthma patients on a controller medication. Selected practices will participate in four learning sessions, each followed by an action period where they will have the opportunity to test changes in their clinical setting. Practices will measure their progress toward improvement goals by utilizing a National Asthma Registry (NAR) which will allow them to enter data and generate metric reports to provide feedback on outcome and process measures. Practices will also use the registry to proactively manage their asthma population by allowing clinician teams to identify patients with asthma before the visit, as well as track and sort follow-up activities. There are two Georgia Chapter groups: one comprised of practices in Metro-Atlanta and one comprised of practices in Outstate-Georgia (i.e. outside the Atlanta area. ).Dixie Griffin, MD of Tifton is the Physician Lead for the Georgia group; and Brad Weselman, MD of Decatur is the Physician Lead for the Atlanta group. Participants are eligible to receive MOC and PICME credits upon successful completion of the project. 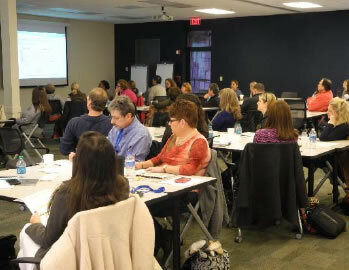 Learning Session 1, an in-person event, was successfully completed on 1/31/15 in Atlanta with 43 attendees from 19 practices. Faculty included Drs. 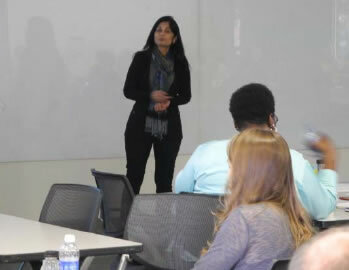 Dixie Griffin, Brad Weselman, and Shabnam Jain from the Georgia Chapter; and Drs. Mark Brown (Arizona) and Peggy Stemmler (Arizona) from the AAP. 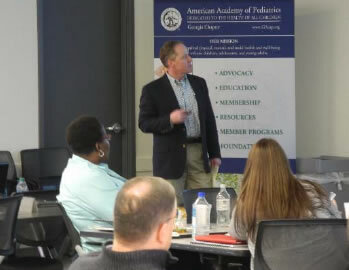 Two Learning Session 2 webinars were completed on 4/14 and 4/16 with 128 total attendees representing practices from all four participating Chapters – Georgia, Kentucky, California 2, and California 4. Drs. Griffin, Weselman, and Jonathan Poplar (Georgia Asthma Expert) joined with their counterparts in the other Chapters to present both sessions. 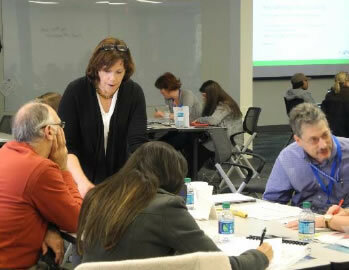 Faculty from AAP included Peggy Stemmler, QI Coach; and Becky Nolan, Billing & Coding Expert.